Create a home office space worthy of an executive with this L-shaped desk and hutch. The large desk offers great storage and work space, with modern features like two built-in AC outlets and adjustable shelving. The hutch offers additional storage and display space with two doors and an open shelf. 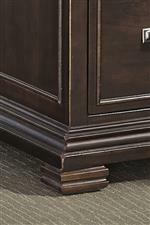 Framed drawer fronts, crown molding, and a dark Brown finish speak to refined traditional style. 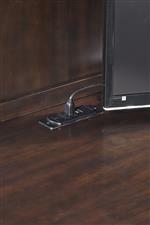 The Weston L-Shaped Desk with Hutch and Built-in Outlets by Aspenhome from Bullard Furniture. We proudly serve the Fayetteville, NC area. Product availability may vary. Contact us for the most current availability on this product. 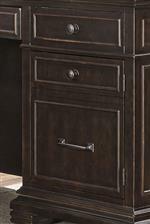 I35-317 66" Credenza Hutch 1 67" 14" 45"
I35-307+308 L-Shaped Desk 1 66" 82" 31"